From 1960 until he retired in 1982, Vernon Johnson enjoyed an influential and varied career in commercial package design, which he described as a process of “communication” from the product’s initial development to the consumer’s purchase decision. After Mount Vernon, he was national art director of another division of Continental Can Company — Hazel-Atlas Glass in Wheeling, West Virginia — where his industrial design talents in 1960-1962 focused on the shapes and labels of glass containers. Next, while director of design at Package Products Company, Inc., in Charlotte, North Carolina in 1962-1968, he lectured frequently at American Marketing Association design seminars and conferences about the evolution of the still-young flexible packaging industry. That his career followed the birth and growth of modern packaging was reinforced in a Package Products brochure: “Vern is our newly appointed Director of Design. His background amazes even us: flexible packaging design work for 16 years (remember our entire industry isn’t much older).” Vernon Johnson spent the last 14 years of his professional career as general director of Styling and Design at Reynolds Metals Company in Richmond, Virginia; he oversaw the design team creating packaging for Reynolds Wrap and related aluminum foil products and he redesigned the company’s complex and multilayered graphic identity (logo) system for a more contemporary look….. Taking early retirement, Dad returned to his artistic true love — watercolors. He set up a retirement business named “Watercolors Unlimited” in his home studio in Richmond, Virginia, and once again was painting a long list of commissions — “house portraits” and “landscape illustrations” of that historic area and the Mid-Atlantic region, as well as more distant places he visited on vacation, including Pebble Beach, Hawaii, France and Vermont. He was as prolific, if not more, in the last 20 years of his career as he was in the first 20, and, as always, he kept detailed lists of painting titles, owners and costs…..His paintings of Virginia and North Carolina scenes remain in homes and commercial offices throughout Richmond, Virginia, and the mid-Atlantic. Meanwhile, Vernon Johnson’s reputation in Mount Vernon, Ohio, was coming full circle. 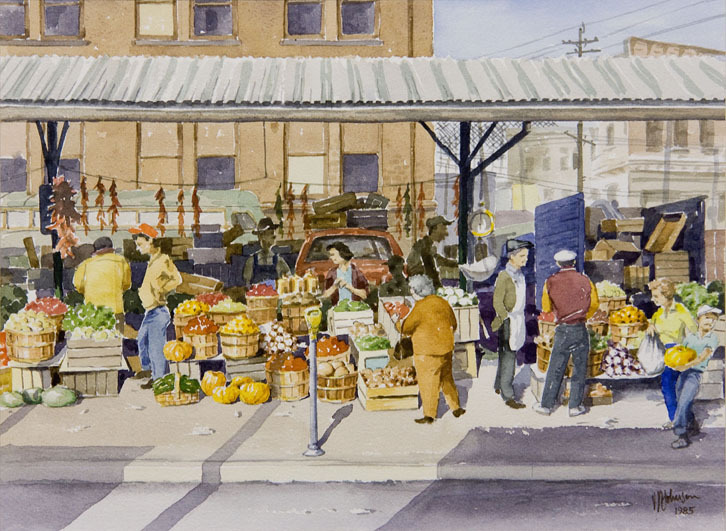 In 1990, Jean Upham Sauter, Peg Beam and others active in the Knox County Historical Society decided to feature his 1950s Mount Vernon watercolors in a special exhibition…..
Vernon Johnson’s story is that he completely and confidently understood the everyday sentiments of ordinary people in the 1950s — he was an innovator in his profession and buoyed by post-war progress, yet still thrilled at state fairs, shopped at friends’ stores, revered the home as the castle and proudly stood by those values and passed them on to children, grandchildren and, hopefully, beyond. Such artists have a personal and enduring connection to what their audiences value. The remarkable effect of Vernon Johnson’s vision is that he carried it throughout his career, from Mount Vernon, Ohio to Wheeling, W. Va., to Charlotte, N.C., and finally to Richmond, Virginia, where he once again painted homes, historic landmarks and familiar scenes that chronicled life in the community. When you read the book, I think you’ll realize how small town life is part of all of us who were born in mid-century America or want to know about its lasting impact because of its influence on our families, our values and our lives today.